Today we conclude our look at Paragon’s current San Francisco Bay Area Apartment Market Report, which was released last month. Let’s turn our attention to factors including rents and interest rates. 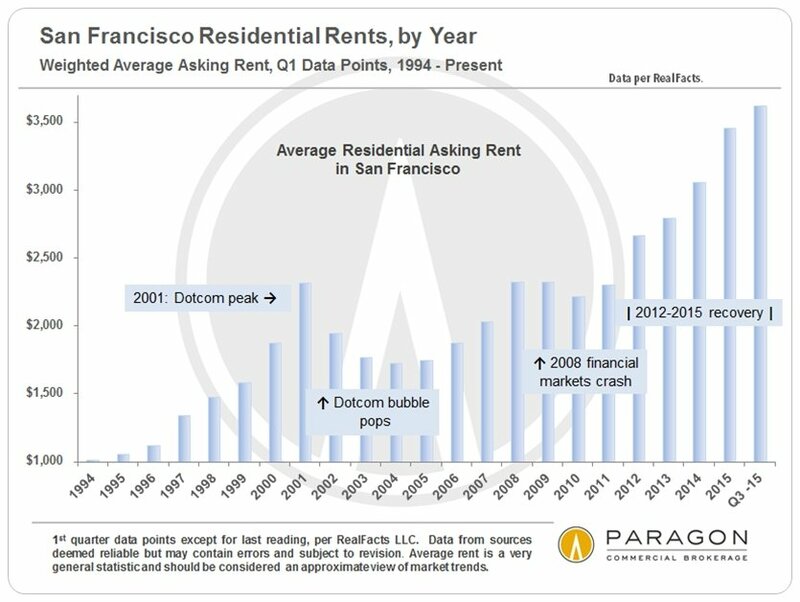 In the chart that accompanies this post, you’ll see that San Francisco rents fell far more following the pop of the dot-com bubble in 2001, as well as the resulting loss of thousands of high-tech jobs, than after the much larger financial-markets crash of 2008. Now let’s turn to interest rates, which over the course of 2015 went up by a negligible one-seventh of one percent to remain close to historic lows. Though many predict that rates will rise appreciably in 2016, the volatility of financial markets may well keep them low, though it’s difficult to predict with any accuracy.